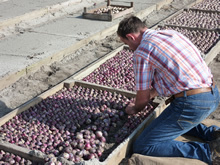 During the summer months hyacinth bulbs are first stored warm, dry and well ventilated to make sure the complete hyacinth plant can develop within the bulb. 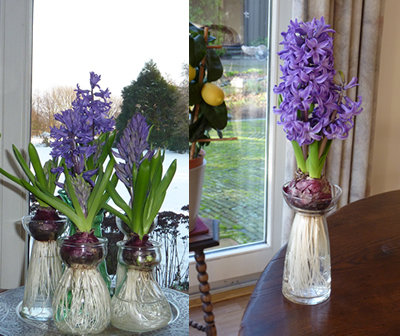 For early forcing (December/first half of January), it is necessary to use so-called prepared hyacinths. 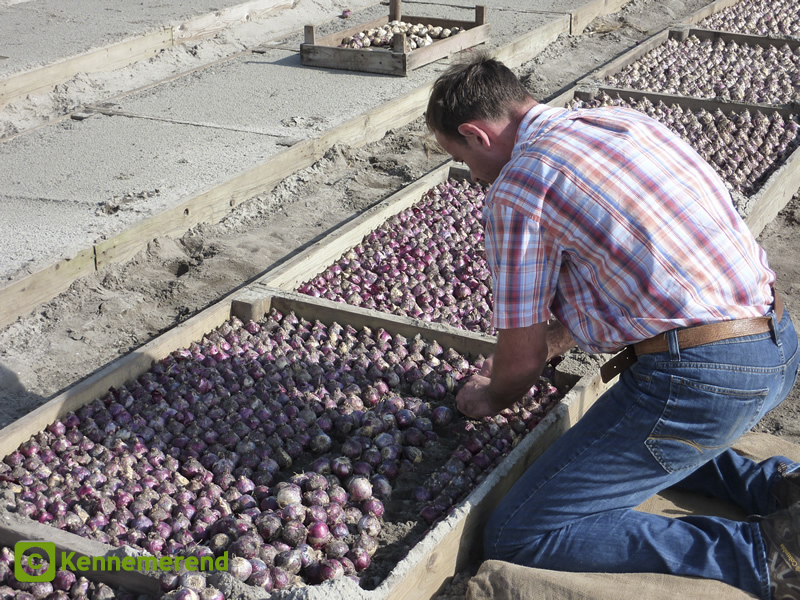 These are bulbs that are lifted by the bulb-growers early in June in order to start the warmth-period early as well. Later harvested bulbs are only suitable for later forcing. Prepared bulbs can be planted (put on water) in September, depending on the variety and the treatment, later bulbs from October. After this warmth-period, the essential cold-period can start. After removing the old roots and loose skins, the bulbs can be placed on the vases at lower temperatures in such a way that the bulbs just touch the water. Many publications advise putting the bulbs somewhat above the water, but in my opinion it is better to put the bottom of the bulb just in the water. By doing so, infection by the fungus Penicillium on roots coming out of the bulb bottom can be prevented on healthy bulbs. Professional forcers of bulbs on water will always put the flower-bulbs just in the water. If a bulb is already infected, the bulb touching the water will cause the water to become foul sooner. Regular refreshing of the water is then necessary. Normal tap water can best be used. It will be free of diseases. No fertiliser is necessary. The bulb contains enough food to ensure a good plant. Normally the hyacinths on the vases are stored in a cool, dark room, although the low temperature is far more important than the darkness, as several experiments of cold storage in light circumstances have shown. Mostly a cold period of 10 to 12 week will do the job. The optimal temperature for this is 9ºC (48ºF). Higher or lower temperatures will less satisfy the cold demand of the bulbs and a longer cold-period will be necessary. However for home forcing temperatures from 5 to 12ºC (41 to 53ºF) are acceptable. Temperatures should not exceed 13ºC (55ºF) to avoid diseases, or be lower than 0ºC (32ºF) as the bulbs with the water will freeze and cause your vases to break. Longer cold-periods will cause taller plants, whereas shorter periods will result in shorter hyacinths. To realise the necessary low temperatures for the hyacinths, the vases with the bulbs must be kept in a cool, unheated place. Suitable places can be cellars, basements, attics, unheated rooms, sheds, refrigerators, in fact all places where the required circumstances are best met. If they are kept in places that are out of sight, put on your calendar dates to check the vases. You will not be the first to find hyacinths flowering somewhere in the attic or in the cellar in spring with very long, yellowish sprouts. I was one of them! Check the water level in the vase from time to time and add water if necessary Refreshing it one or two times during the whole forcing process is advisable. Should you notice cloudy, smelly water, always refresh it. Very probably the bulb was already infected with Penicillium or another fungal disease, before planting, causing the bulb to rot at the bottom. Refreshing the water a few times in such cases can help achieve a flowering plant, although it will stay mostly much shorter. Refreshing is best carried out by pouring out all the water from the vase in such a way that the roots of bulbs stay in the reservoir of the vase. After the necessary cold-period, usually about 10 weeks, the vases can be brought into a heated room. The sprouts will be mostly between 3.0 and 7.0 cm (1,5 and 3,0 in). The higher the temperature where the plants are forced, the shorter the plant will stay. Choose a light spot, e.g. the window sill. Suitable temperatures range from 18.0 to 23.0ºC (64º to 73ºF). Lower temperatures will produce taller plants. If you know you will force at low temperatures, give the hyacinths a shorter cold-period. Here, too, check the water level and top it up, refreshing cloudy water if necessary. 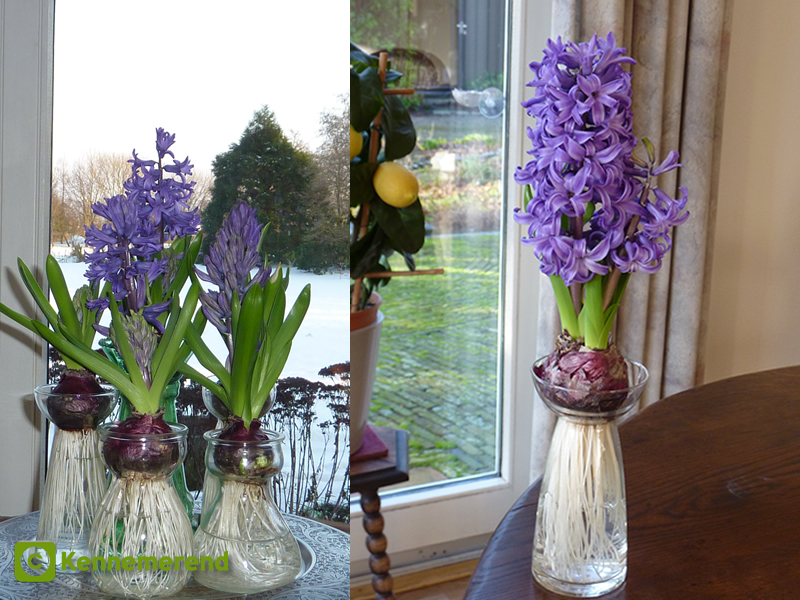 The biggest problem met in forcing hyacinths on glass, is rotting of the bulb bottom usually causing also foul water. Mostly this has to do with a minor or major rotting of the bulb base at spots where the roots come out of the bulb bottom before they are planted on soil or water! Roots start to grow out in humid conditions. Therefore do not store the hyacinths in cool, humid conditions because the rooting bulbs will invite Penicillium rot. If the bulbs are ready for the cold-period, plant them on water as described. If not, store in dry, ventilated, warmer conditions. Penicillium is a very common fungus, manifesting itself for instance also on your cheese, bread and apple sauce. Another problem is the tipping over from the vase of a plant that is too big. First of all it is important to try to grow relatively short plants. Do not give a too long cold-period, do not bring the vases in with too-long sprouts and do not force too cold and too dark. When the forcing conditions are cool and/or dark, use a shorter cold-period. In Britain and Germany there are examples of vases that are designed in such a way that an iron support can be placed around or inside the special rim of the vase to hold the plant. It is also possible to use a thin iron stake, special iron support to put through the bulb, even into the reservoir to fix the plant on the vase. The size of the bulbs is mostly expressed in cm circumference: from 13 or 14 up to 19 cm. The bigger the bulb, the bigger the plant and the more flowers per inflorescence. Very big plants can tip over more easily. Top: from left to right: The variety Blue Pearl rooting during the cold period and just brought in. Bottom left: starting to flower. Bottom right: The fully flowering large sized 19 cm bulb, carries next to the main inflorescence two flowering side shoots. Professional forcing: production on a large scale. 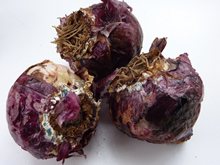 Hyacinth bulbs suffering from Penicillium rot (grey mould) on the rim of the root plate - the most occurring problem in home forcing of hyacinths.